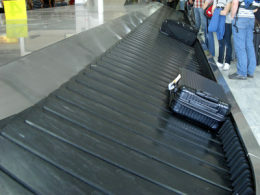 The webpage, Airport Luggage Carousels – A Worldwide Report, is from the appropriately named website, Dull Men’s Club. For most people, the only thrill received from carousels is from the sense of relief that they get when their luggage is spotted. Not so for the site’s owner, Grover Click, who loves finding his bags because he thinks it’s an exciting event in and of itself. Furthermore, Mr. Click says that his greatest travel thrills are obtained by watching the movement of carousels. Most of the webpage deals with the direction that carousels run in various airports (talk about earth shaking subjects!). The percentage of carousels that go clockwise vs. counterclockwise are even tabulated (so far most run counterclockwise). Beyond the curiosity factor, one has to wonder if there are those who find this information to be useful. Can you imagine if there are people who avoid certain airports because they didn’t like the direction in which their carousels moved? If you’d like to help Mr. Click keep keep his data current, let him know which way carousels turn in airports that you visit: info@dullmen.com.